Our normal kitchen grater is the standard four sided steel with a steel handle, not the most comfortable to use, though it works. When I saw the 1Easylife Stainless Steel 6-sided Box Grater, I was anxious to see if it was easier to use. 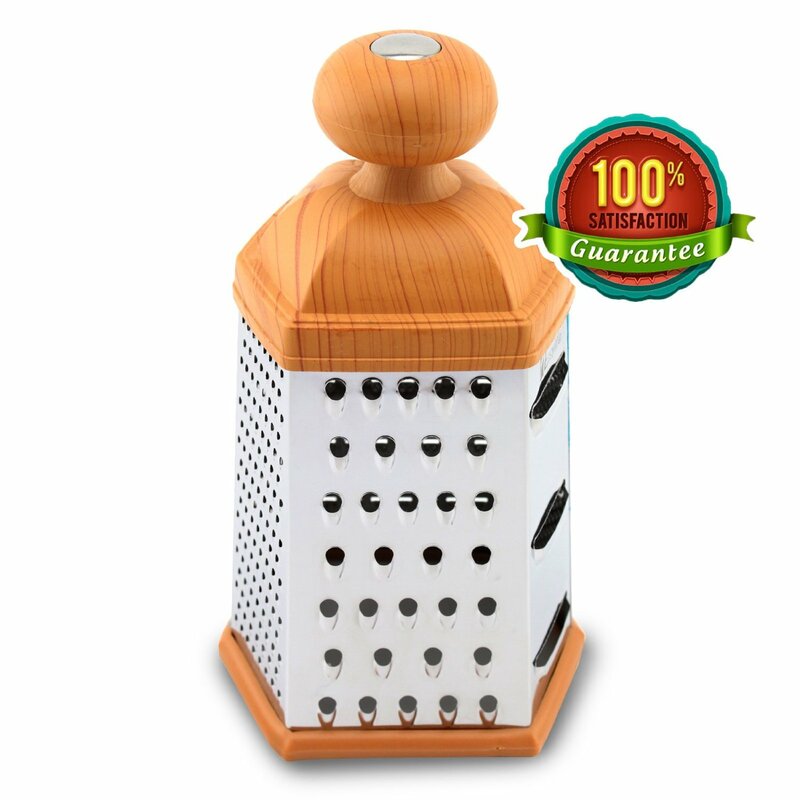 This grater is a nice stainless steel with a silicone base and a sturdy knob handle at the top. The 6 sides each have a different grate texture, making it more versatile than the standard 4 sided ones. The base holds nicely onto the cutting mat we use for grating (The mat is flexible, making it easy to pick up the grated foods and add them to a bowl or use as needed.) I like that it did not slip around, no matter what I was grating. My older steel grater was not so helpful. The knob makes for a nice handle and is easy on the hands. But this is a grater, so I needed to make sure it was good at its job. After testing several different foods of various hardness/softness levels and using all 6 sides, I’m pretty impressed! This grater not only is easy to use, but it does an excellent job with everything we tested it on. The final test is always ease of cleanup. This grater rinsed off easily. I did use my brush on one side, but only needed a light brushing to clear a small area. It rinsed clean and was ready to set aside until its next use. I’m very impressed with this box grater. It might not be my choice when I need large volumes grated – that’s when I bring out the food processor – but for everyday use, it’s an excellent grater. Highly recommended!